First Cook the Tapioca. Take tapioca into a bowl and add water. Place this bowl in pressure cooker and cook. After first whistle, cook the tapioca on low flame for 10 minutes. Allow the pressure cooker to cool down completely. With the amount of water used, tapioca will be slightly under cooked. Do not worry as the remaining portion will get cooked in the milk. Heat a pan and add ghee. When ghee is melted, add the cashew nut pieces and fry stirring on low flame. Fry the cashew nuts till they start changing color. At this stage switch off the flame and keep the pan aside—the cashew nuts will get a nice color with the heat of the pan. Heat a heavy bottomed pan and add milk. Bring the milk to a boil and lower the flame to medium. When the pressure cooker has cooled down, remove the bowl from it and mix the cooked tapioca with a spoon. Add the cooked tapioca to the boiling milk and cook stirring. Allow the kheer to thicken a bit. Meanwhile powder the cardamoms. Take out the shells of cardamoms and powder the seeds in a mortar & pestle. When the kheer starts thickening add the cardamom powder and mix well. When the kheer id done add the fried cashew nut pieces along with the ghee and mix again. Transfer the kheer to a serving bowl when the consistency is slightly thin. Let the consistency of the be of pouring consistency as the kheerkheer thickens on cooling. While serving mix the kheer well and serve to enjoy it. Serve the kheer hot or cold as desired. 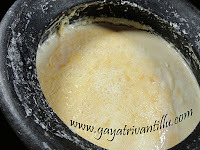 Cooking tapioca in pressure cooker is a less messy job and time saving too. Tapioca takes more time to get cooked in milk when added directly to the milk. When cooking tapioca directly in the milk, it needs to be stirred all the while otherwise it will get burnt at the bottom of the pan. so it is advisable to cook the tapioca in a pressure cooker. With the amount of water used to cook the tapioca, the tapioca grains will be slightly under cooked. Later when we cook this cooked tapioca in the boiling milk, it gets cooked fully. If we fully cook the tapioca in pressure cooker and then add it to the boiling milk, by the time kheer is prepared, tapioca gets overcooked and gets mixed in the milk. To see the grainy texture of tapioca follow the above procedure exactly as shown. Transfer the kheer to a serving bowl when the consistency is slightly thin. Let the consistency of the kheer be of pouring consistency as the kheer thickens on cooling. Let the consistency of the kheer be thinner, if serving it cold. As said earlier it thickens on cooling. Add few spoons of sugar additionally as cold kheer tastes less sweet. For additional flavor add a little bit of edible camphor to the cardamoms while making powder. Iam a very frequent visitor of ur website.I appreciate your presenation skills. I want to learn "Aloo Samosa". So i request you to pls display the receipe for Aloo samosa in ur site or pls mail me the receipe to yamini.yamini2007@gmail.com, if you don't mind. My children (ages 3 and 6) will not eat what I send in the school tiffin box. Please suggest any recipes. I am at a loss as to what to send with my children. how to make daily food shedule what to give them to eat.As u r a mother what u have given to ur child some tips that may help me as well as many viewers. Please help. As blogged on this site, it seems "Lunch Box" recipes seem to be very important for the kids. I would work on it and try to host a video on this issue. Due to my husband's transfer we are relocated and the house is in a big mess. It may take about six months before we settle down and I get back to making recipes. But definitely I take your request. hi gayatri garu...tanks for best Telugu recipes,staying in pune i always missed Andhra food, but now i am regular follower of ur recipes. please add some healthy juices in your website, which i can store for least 2 days, thank bye. 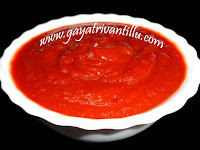 Really you are amazing.... love u.
namasthe .One year US lo you saved me from pitzzs ,burgers and other junnk food.Fell in love with cooking Once I saw your website in US.Used too cook and carry different items in US for one year.You are saving lot many batchlors and food lovers abroad also.India ki vachhina taruvatha , I told about Gayatri vatillu to all my friends .I used to refer Gayatrivatillu in weekends to prepare some special items giving wife some break .Meeru ellla kalam , sukanga, arogyanga undali.